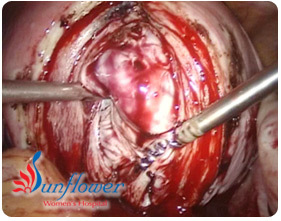 This is a removal of uterus via laparoscopy. Uterus is released from its attachments with energy sources & harmonic scissors. Once it is freed specimen is delivered vaginally. This facilitates removal of both fallopian tubes and ovaries. As entire procedure is done laparoscopically it greatly reduces chances of vaginal contamination. Studies have proved that when there is no contra-indication TLH is route of choice for hysterectomy. There are mild to severe staging of endometriosis, which can be diagnosed, staged and treated Laparoscopically depending on stages by simple fulguration to adhesiolysis to removal of endometriotic lesions through Laparoscope. 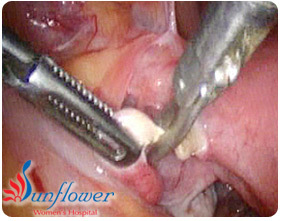 Chronic inflammatory tubo ovarian masses can be removed through laparoscope encouraging speedy recovery. This life threatening condition of abnormal pregnancy location mostly in fallopian tube. 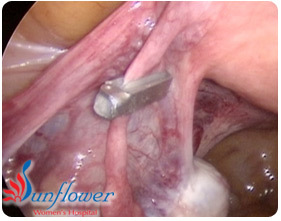 It can be diagnosed precisely by laparoscopy and treated simultaneously with excellent result. It avoids laparotomy which hastens recovers & prevents adhesions which may otherwise contribute to secondary infertility. Small to huge or multiple lmyomas can be removed safely with the use of morcellator and fertility conditions may be regained. This prevents laparotomy, reduces blood loss, makes preservation of fertility & T- O relations and also allows precise suturing of uterus. Pelvic inflammation & infection commonly tuberculosis & non specific type leads to adhesions (abnormal connecting bands) between pelvic organs. This can be treated efficiently relieving clinical symptomatology and re-establishing fertility status by laparoscopy due to crisp image & magnification provided. Pneumoperitoneum helps to find correct tissue planes.. Almost 30 % women face problem of PCOD. Before starting stimulation in IVF – ICSI it is advisable to perform LEOS (Ovarian Drilling). It is done using monopolar current. It deandrogenizes the ovary & corrects the hormonal mileu which not only enhances results of IVF & IUI but also reduces risks of miscarriage. Ovary may have many pathological masses which may be benign or malignant. Benign Ovarian masses can be removed laparoscopically & the specimen retrieved by endo bag to prevent intra abdominal spillage. 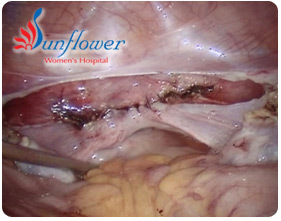 Laparoscopy prevents incision, blood loss, allows preservation of normal ovarian tissue & reduces adhesions. All these factors have fertility enhancing effect. 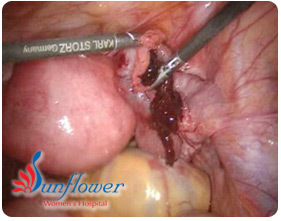 It is most common laparoscopy surgery in female. It is a day care operation. This may be done with Filshi Clips, Fallope Rings or bipolar cauterization. 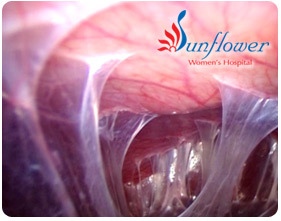 It reduces tubal damage as compared to open tubal surgery which facilitates reversal; if need be. It is indicated in Distal Tubal Block (DTO) on HSG, Adherent & Fimbrial block fimbriae can be opened to enhance chances of natural conception & conception by IUI. It requires the use of specialized instruments & advances skills. Post hysterectomy vault prolapse is associated with considerrable morbidity. Laparoscopic Coplopexy with prolene mesh is gold standard for Vault prolapse. Lapsroscope allows precise identification of tissue planes & proper fixation of mesh to sacral promontry. Anterior Sling which involves fixation of isthmus of uterus to pectineal ligament by mersilene tape & Burch Colp[osuspension can be done laparoscopically. They allow precise dissection in Space of Retzius & magnification allows proper suture placement on pectineal ligament. Enterocele repair is herniation of small bowel through POD. Ot can be done by Halban’s Method using Prolene sutures. Laparoscope allows to avoid inadvertent rectal & ureteric injury.through laparoscopy.